I had been watching this auction for the last several days. It's a Mint Never Hinged 1934 Airmail Communication Souvenir Sheet that I'm betting won't fall into my hands too soon. It went for $1,114.55 earlier today. Those gray zigzag marks are the watermark of the paper. 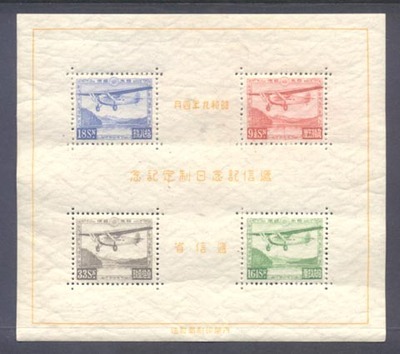 That's the most common one in the Japanese stamp history. At least I got a good scan for my virtual stamp album. It's worth a lot more than the one I have here in reality.